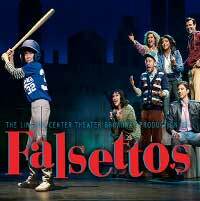 Fresh off its Tony-nominated Broadway revival, Falsettos arrives at the Kennedy Center in DC as "an exceptional production of a perfect musical" (The New York Times). The story revolves around a charming, intelligent, neurotic gay man named Marvin, his wife, his lover, his about-to-be-Bar-Mitzvahed son, their psychiatrist, and the lesbians next door. At times both hilarious and achingly poignant, Falsettos shines an ahead-of-its-time spotlight on the infinite possibilities that make up a modern family ... and a beautiful reminder that love can tell a million stories. A hit when it premiered on Broadway in 1992, this ever-relevant show won Tony Awards for its book by James Lapine and William Finn (The 25th Annual Putnam County Spelling Bee) and its score, also by Finn.